Corn producers who want to fine-tune nitrogen (N) application rates must first determine how much N is being supplied by the soil. This may change significantly with each growing season depending on a host of factors including crop rotations, tillage and weather. This article provides an example of how spring soil nitrate concentrations can vary from year to year in a situation where crop management factors are held constant. A research project started in 1990 to measure soil nitrate-N concentrations in the surface foot of soil. Measurements were taken on or near June 1, on a long-term experiment located at the Elora Research Station, University of Guelph. 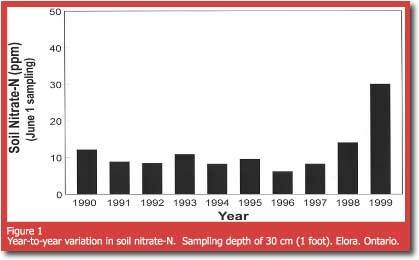 Figure 1 shows the yearly variations in soil nitrate-N concentrations from 1990 to 1999 where corn has been planted continuously. Fertilizer N was always applied side-dress, at a rate of 140 lb N/ac, so the observed nitrate concentrations represent the N availability prior to fertilizer N application. From 1990 to 1997, nitrate-N concentrations typically ranged from eight to 12 ppm concentrations which according to the soil N test, would indicate fertilizer N requirements ranged from 100 to 140 lb N/ac. However, soil nitrate-N concentrations dramatically increased during 1998 and 1999 years with April and May temperatures which were substantially (2 to 6oF) above normal and rainfall amounts which were half to two-thirds of normal. The unusually warm springs of 1998 and 1999 probably increased rates of N release from organic matter. When coupled with below normal rainfall (which minimized the potential for leaching) nitrate concentrations ended up greater than those observed during any of the earlier eight years. Starting in 1996, we also measured the quantity of nitrate-N in the fall (early November). We thought perhaps excessive fertilizer N application would result in unusually high quantities of nitrate in the fall. During 1996 and 1997, fall nitrate-N amounts were generally low (25 lb N/ac) and probably reflect the amount of nitrate which can be expected to accumulate from natural sources. However, the quantity of residual nitrate measured in the fall of 1998 was 90 lb N/ac, suggesting that fertilizer N requirements were not as great during 1998. It's interesting that the nitrate-N concentration during the spring of 1998 suggested that only 80 lb/ac of N fertilizer was required, which is 60 lb/ac less than applied. This over-application seems to be reflected in the quantity of N left over at the end of the season. Clearly, the quantity of soil-supplied available N (and, as a consequence, corn fertilizer N requirement) can vary greatly from year to year. Higher spring nitrate concentrations, warmer spring temperatures, and (or) below normal rainfall seem to be related, but the soil N-test is the only way to confirm the actual quantity of naturally available N.
We acknowledge there is some controversy about the ability of the soil N-test to pinpoint corn fertilizer N requirements on the field scale. But there is considerable research which suggests the soil N-test fits into an overall nitrogen management strategy and will help identify fields and years where fertilizer N is definitely not required...or can be applied at substantially reduced rates.